I might as well not pretend I don’t have it, and share what I do to try to conceal it, huh? it’s not absolutely undetectable, but it’s a great help WITHOUT DISRUPTING THE COLD SORE, and provides a confidence boost when you’re in dire need of it. when you go through your stash and realize you have almost a full face of makeup from the same brand, and realise that the shopping of most of the products occurred in the past year or so, you know they’re doing something right. Too faced is a girly-cute-vintage-inspired-with-a-touch-of-madness-design makeup brand from California, on the affordable yet high-end scale of things, that can be purchased virtually and physically basically everywhere (bonus points) and a selection of star-products that have been raved one by one all over the place. I decided to gather them all in one post and throw them a party. 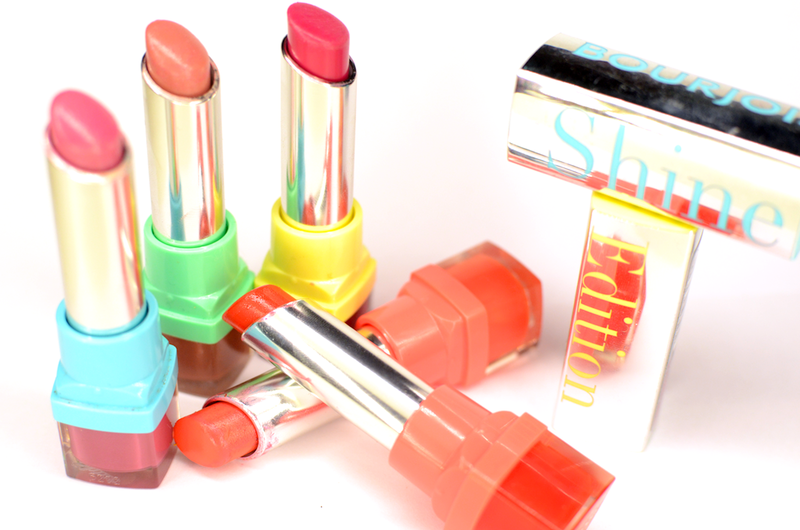 this summer it’s all about those creamy sheer lipsticks with a punch of colour. I’m all for it, but I’m not in thinking of splurging on Bobbi Brown, Estée Lauder, Urban Decay or Clinique. I’m on a #shopyourstash mode, and I couldn’t be happier: I found a few lipsticks from Bourjois, from the Shine Edition Collection that I’ve had for quite a while and that have that same effect, and that you can find for under 13€ a piece (about half the price of some of the on-trend ones).